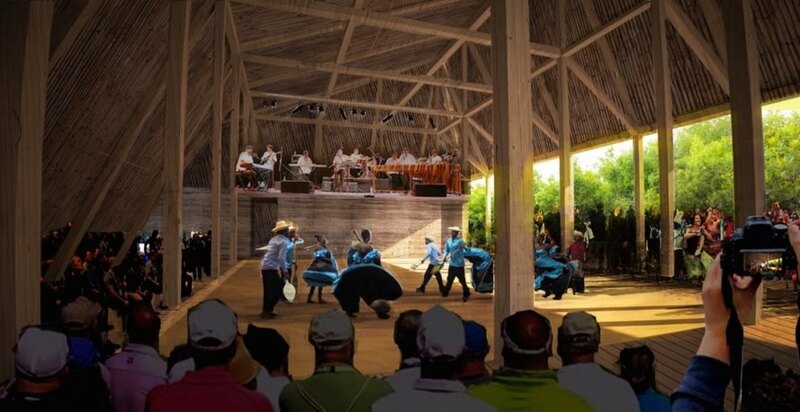 Caá Porá, Siete86 and Ingeniera Alternativa designed a cultural center in the UNESCO heritage province of Esmeraldas to celebrate Afroecuadorean culture, marimba music, and traditional dance. Proposed for Tambillo, Ecuador, the center, named Palenque Cultural Tambillo, would give the community a dedicated place to express their heritage, pass down their musical traditions to their children, and share their culture with tourists. The design comprises a collection of buildings built using local techniques, as well as ecologically friendly materials and energy efficient principles to keep operating costs at a minimum. The Afroecuadorean town of Tambillo is located in the “region of the marimba,” a type of percussionist folk music that UNESCO has described as an intangible heritage of humanity. Unfortunately, those celebrated traditions are at risk due to intra-generational learning gaps and insufficient rehearsal and performance facilities. Palenque Cultural Tambillo was created to help continue those artistic traditions and was designed through a series of participatory research and design workshops with the Tambillo community in October 2015. The final design comprises the performance center, located in the main building, and a cluster of smaller buildings for workshops and classrooms. The performance center would feature a dance floor made from packed sand and opens on one side to the mangroves for natural ventilation, light, and to acknowledge the important role the environment plays in culture. The building frames would be made from locally harvested wood and topped with palm thatch roofs. All walls would be made from rammed earth with crushed oyster shells and clamshells. It’s unclear if the project has been funded or will be built. Palenque Cultural Tambillo was created to help continue artistic traditions and was designed through a series of participatory research and design workshops with the Tambillo community in October 2015. The performance center would feature a dance floor made from packed sand and opens on one side to the mangroves for natural ventilation, light, and to acknowledge the important role the environment plays in culture. The building frames would be made from locally harvested wood and topped with palm thatch roofs. All walls would be made from rammed earth with crushed oyster shells and clamshells. The final design comprises the performance center, located in the main building, and a cluster of smaller buildings for workshops and classrooms.